What makes the E71 X6 M unique? The E71 X6 M is a high-performance version of the E71 X6 "Sport Activity Coupe" that was engineered by BMW M GmbH (an independent subsidiary of BMW AG). 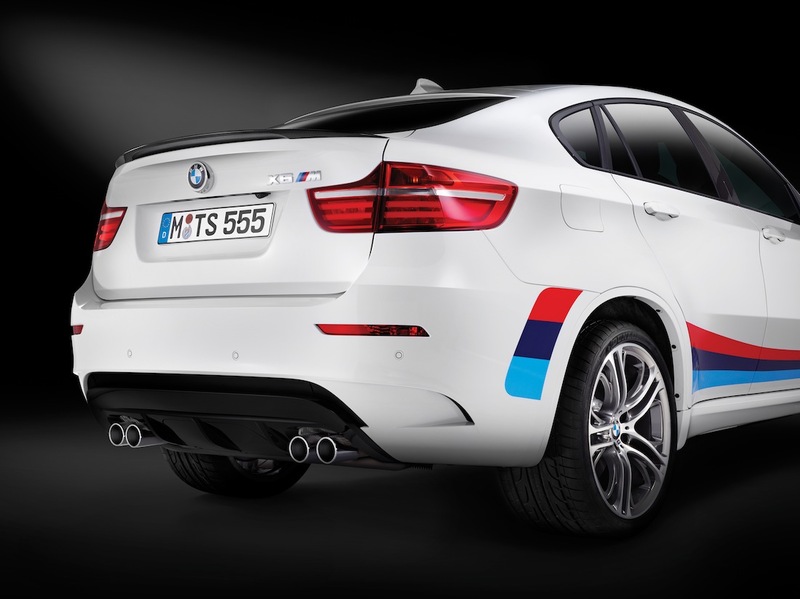 It is powered by a 4.4-liter twin-turbocharged V8 engine developed by BMW M, and is equipped with many other enhancements to its chassis and cosmetics that distinguish it from other X6 models. However, it shares the majority of its mechanical components with the larger E70 X5 M.
Where was the E71 X6 M first introduced? The E71 X6 M was first introduced at the 2009 New York Auto Show, alongside its E70 X5 M sibling. Where was the E71 X6 M produced? Like nearly all E71 X6 models sold worldwide, final assembly of the X6 M took place at BMW's Spartanburg, South Carolina factory. However, its entire drivetrain was produced in Germany and mated to the car at Spartanburg. Why was the introduction of the E71 X6 M considered by some to be controversial? The E71 X6 M was the first sport utility vehicle (along with the E70 X5 M) to be engineered by BMW M GmbH. Because of BMW M's formidable history in motorsport and its long tradition of building high-performance street cars, its decision to produce a very large and heavy sport utility vehicle was seen by some as a dilution of the company's core values. 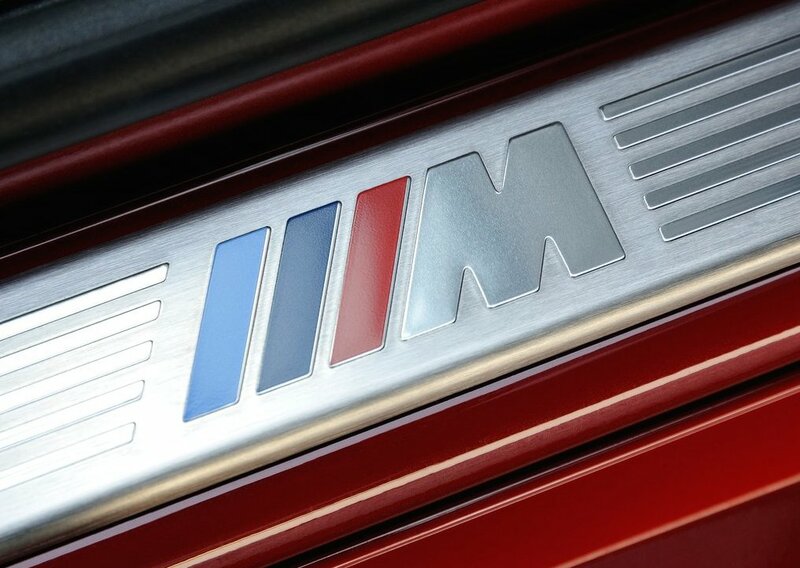 This was bolstered by the fact that the X6 M was the first BMW M product (along with the X5 M) to feature all-wheel drive, as well as the first to be offered exclusively with a conventional automatic transmission. What significant changes were made to the E71 X6 M during its production? How many official versions of the E71 X6 M were offered? BMW M produced three different versions of the E71 X6 M: European-specificaiton models in both left-hand drive (GZ01) and right-hand drive (GZ02), which were sold in all worldwide markets outside of North America, plus a North American-market version (GZ03) in left-hand drive only. How many examples of the E71 X6 M were produced? 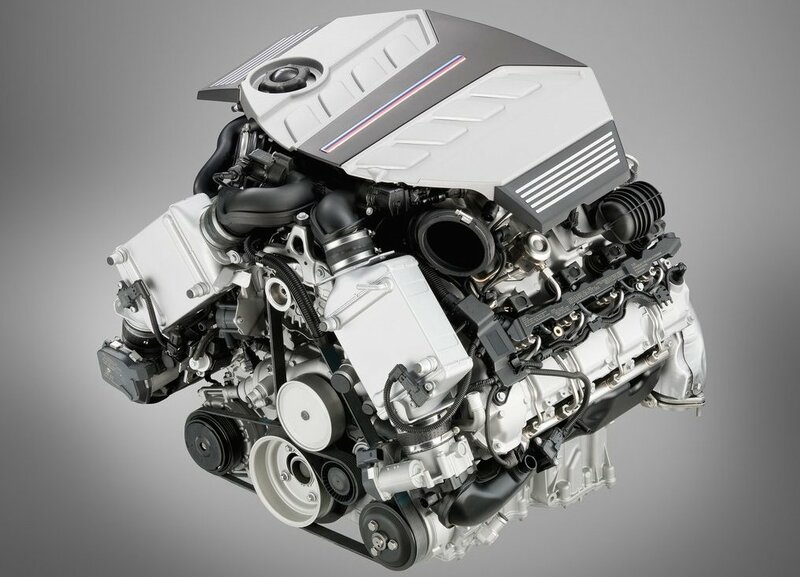 How is the E71 X6 M's S63 powerplant different from the standard N63? What transmission is offered in the E71 X6 M? The E71 X6 M is equipped exclusively with a twin ZF 6HP26S six-speed automatic transmission. This heavy-duty adaptation of the ZF 6HP26TU features a double-damper torque converter with revised spring characteristics, an aluminum oil pan and enhanced air flow characteristics. In addition, the M-specific transmission software enables quicker shift times and prevents automatic upshifts at redline in manual mode. There is also a launch control feature. Gear ratios are identical to those of the 6HP26TU: 4.17 (1), 2.34 (2), 1.52 (3), 1.14 (4), 0.87 (5), 0.69 (6). The final drive ratio is 3.91:1. What are the specifics of the all-wheel drive (xDrive) system used in the E71 X6 M? The E71 X6 M uses a variation of BMW's xDrive all-wheel drive system that has been calibrated to deliver rear-wheel drive characteristics by sending more torque to the rear wheels under most driving conditions. 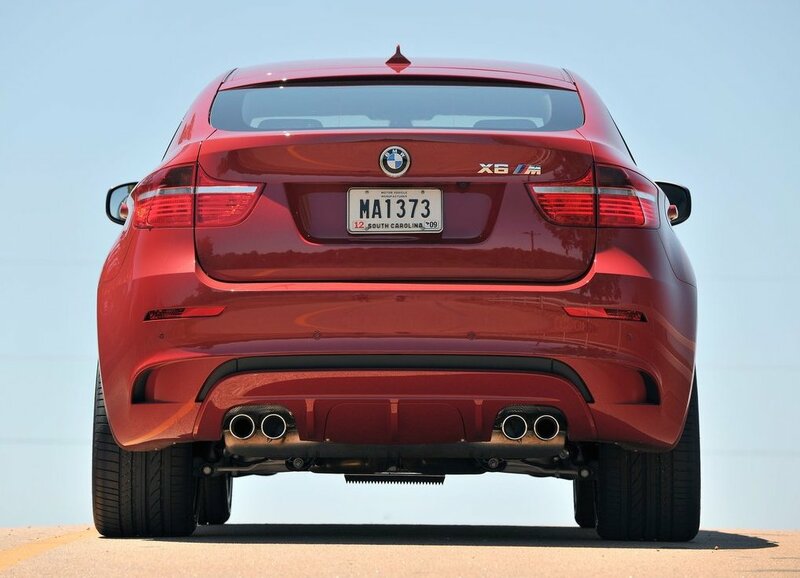 In addition to transferring power between the front and rear axles depending on the amount of traction available to each of the four tires, the xDrive system in the X6 M is paired with Dynamic Performance Control (DPC) to adjust the distribution of torque between the two rear wheels based upon a multitude of parameters: vehicle speed, throttle position, wheel rotational speed, steering angle and yaw rate. The DPC functions via a pair of multi-disc clutches and planetary gearsets, one on each side of the rear differential, which are controlled by an electric servo that receives information from the Dynamic Stability Control system. How does the Dynamic Stability Control (DSC) function in the E71 X6 M? The Dynamic Stability Control (DSC) system in the E71 X6 M generally functions in the same manner as the DSC in other X6s. However, the system also has an additional M Dynamic Mode (MDM) that the driver can activate via the iDrive menu. This mode simultaneously raises the the threshold at which the DSC will intervene and also allocates more engine power to the rear drive wheels, thereby reducing understeer and enhancing rear-wheel drive handling characteristics. What is MDrive and how does it function in the X71 X6 M? MDrive allows the driver to customize specific aspects of the E71 X6 M's driving dynamics to his or her specific preferences in the following areas: throttle response + transmission response + exhaust note (two modes), EDC suspension damping (two modes), Servotronic steering response (two modes) and DSC activation (three modes). 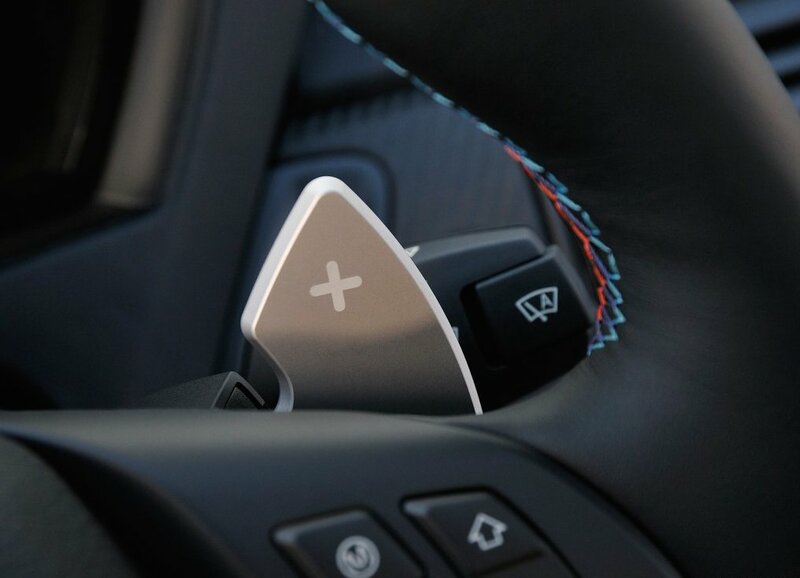 These preferences can then be set via the iDrive to activate at the single press of an "M" button located on the steering wheel. How does the suspension of the E71 X6 M differ from that of other E71 X6 models? What type of braking system is used by the E71 X6 M? The E71 X6 M is equipped with four-wheel vented disc brakes with cast iron rotors that measure 15.6-inches in the front and 15.2-inches in the rear. The front brake calipers are a fixed, four-piston design manufactured by Brembo, while the rear brake calipers are a single-piston design comprised of an aluminum inner hat and a cast iron outer portion that are connected with steel pins. What type of steering system is used in the E71 X6 M? What types of wheels and tires are fitted to the E70 X6 M? 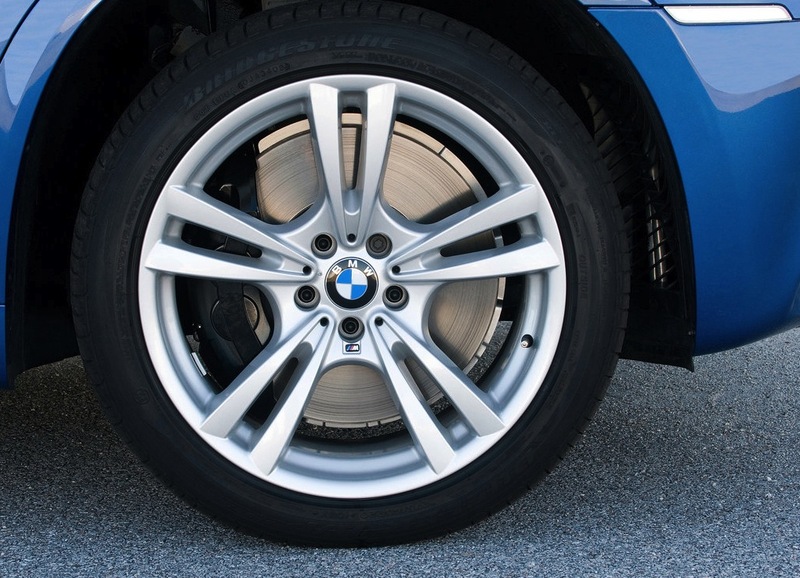 The E71 X6 M (along with the E70 X5 M) is the first BMW M vehicle equipped with run-flat tires. These measure 275/40R20 in the front and 315/35R20 in the rear. 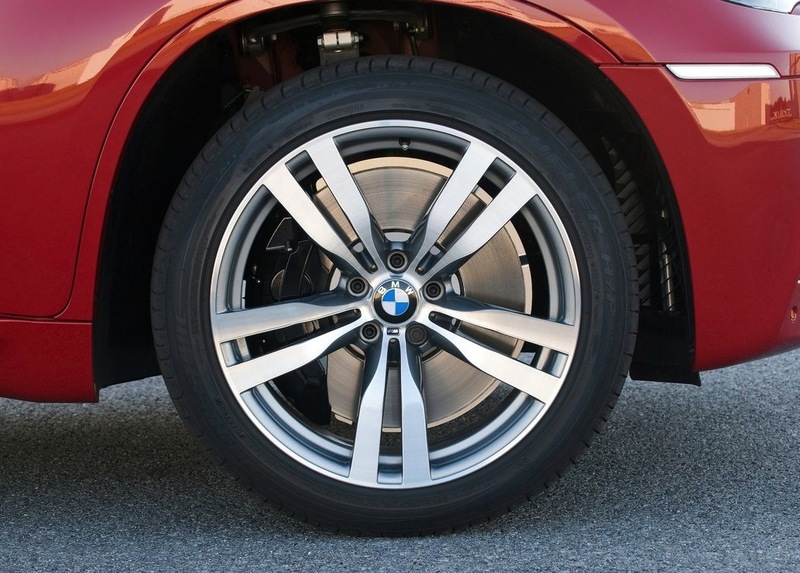 The tires are mounted to one of two available cast alloy wheel designs, both unique to the E70 X5 M & E71 X6 M and both measuring 10 x 20-inches in front and 11 x 20-inches in the rear: M V-Spoke (Style 299M) and M Double Spoke (Style 300M). NOTE: Only the Style 300M was offered on the X6 M in the U.S. market until 4/2012 production. How does the exterior of the E71 X6 M differ from that of other E71 X6 models? The exterior of the E71 X6 M is distinguished by a number of specific bodywork features that are not found on other E71 X6 models (though many are shared with the E70 X5 M). Items shared with the E70 X5 M include the hood, headlights and front bumper/fascia. The latter is much deeper than the version found on the standard X6 and incorporates a series of large ducts that feed air to the front brakes, auxiliary radiator and oil cooler. 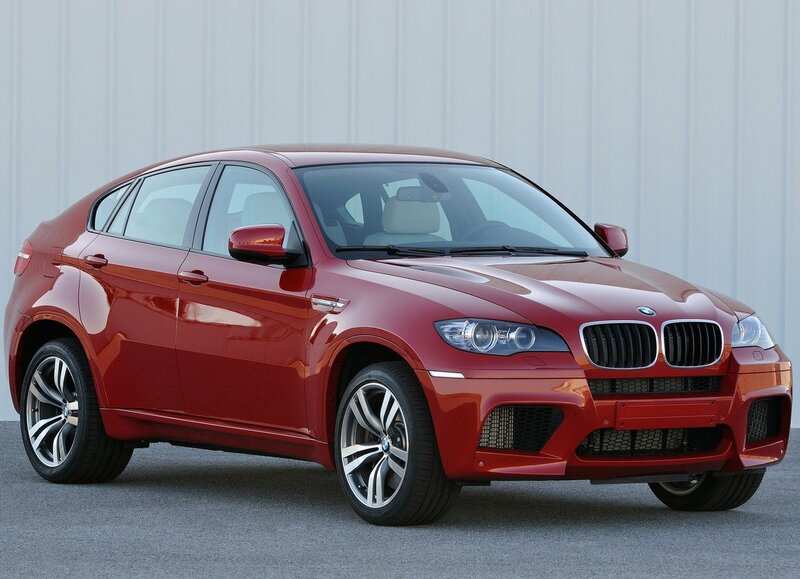 Starting with 2013 models (from April, 2012 production), the X6 M adopted the wider "kidney" grille with contoured vertical slats used on all LCI versions of the E71 X6, as well as the aluminum hood with raised central "power dome" that first debuted on the X6 ActiveHybrid. The front fenders feature horizontal side marker turn signals enclosed by a chrome trim piece bearing the "M" logo. The fender trim and side rocker panels are painted in the body color and are similar to the ones included with the E71 M Sport package. The rear-view mirror housings (shared with the E70 X5 M) have a more aerodynamic shape and a prominent black lower section. 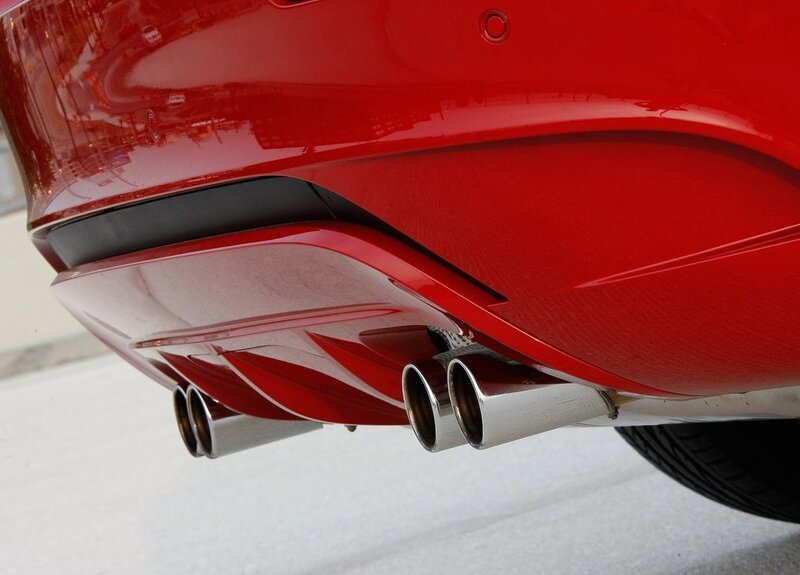 The unique rear bumper design incorporates a prominent diffusor and the signature quad exhaust tips found on all M Series products since the late 1990s. Finally, all X6 Ms are equipped with high-gloss Shadowline window trim and there is a single "X6 M" badge on the rear hatch. How does the interior of the E71 X6 M differ from that of a standard E71 X6? The interior of the E71 X6 M shares its overall design and construction with that of other E71 X6 models. 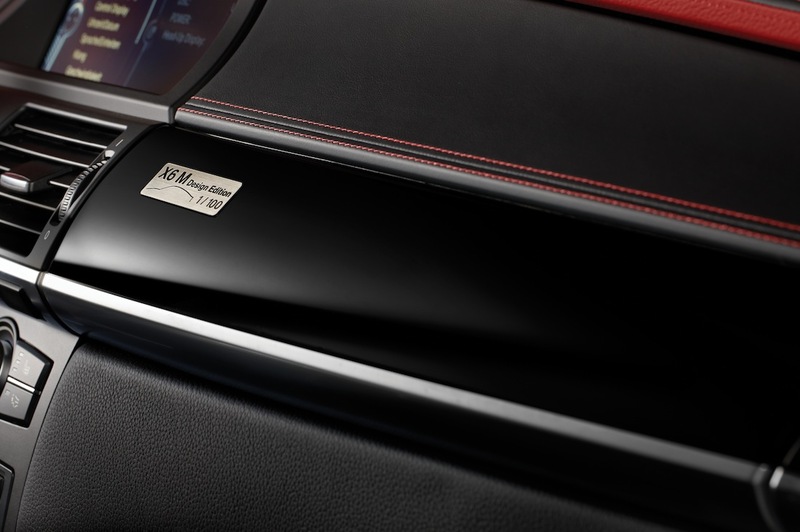 It also shares a number of items with the X6 M Sport package: Anthracite headliner, door sill plates with the "M" logo and aluminum M dead pedal. 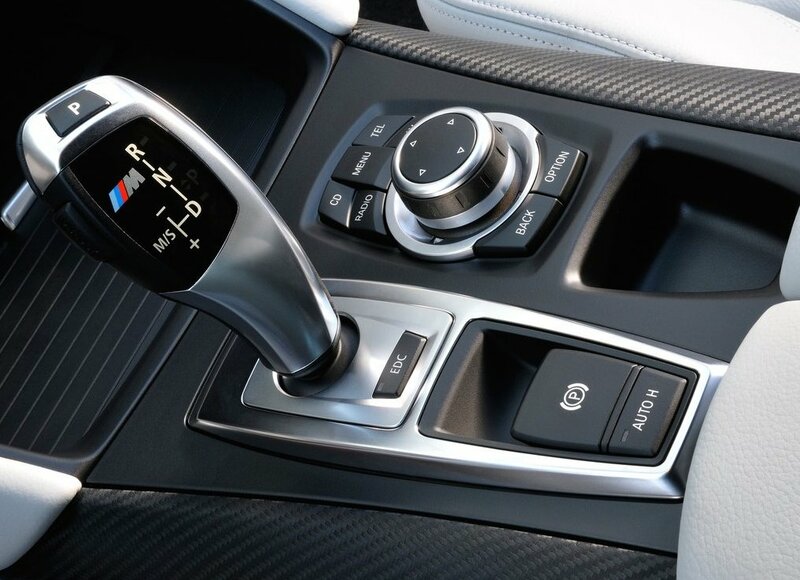 The X6 M steering wheel, though similar in shape and form to the M wheel found in X6 M Sport models, features tri-color M stitching on the rim, larger M shift paddles and the MDrive button. 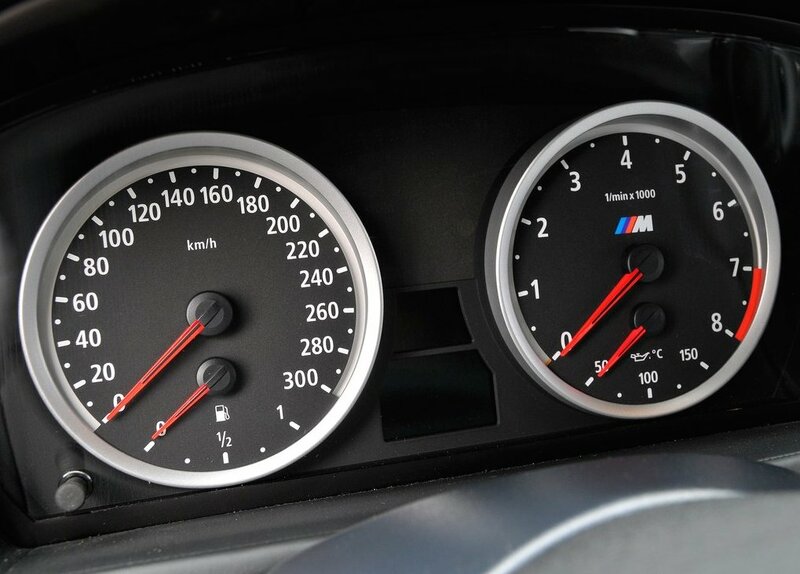 The instrument cluster, with its red needles, oil temperature gauge and "M" logo on the tachometer face, is identical in style to the one used in the E60/E61 M5 and E63/E64 M6, though the calibrations are specific to the X6 M (and X5 M). The standard front sport seats are a variation of the normal X6 sport seat but are covered in Merino leather and include the "M" logo on the headrests. They are heated and have adjustable lumbar support, as well as a two-position memory function on the driver-side, but the side bolsters are fixed. As an extra-cost option, the X6 M could be equipped with the same multi-contour front seats offered in other X6 models, though covered in Merino leather (but without the "M" logo on the headrests). These multi-contour seats were also offered with active ventilation (in combination with perforated Merino leather) and active support for the driver's seat (packaged together in some markets). Four types of BMW M interior trims were offered in the X6 M (all shared with the X5 M): brushed Aluminum Shadow, Carbon Leather Structure, Piano Black and Red Brown Figured Eucalyptus wood. Were there any special editions of the E71 X6 M? 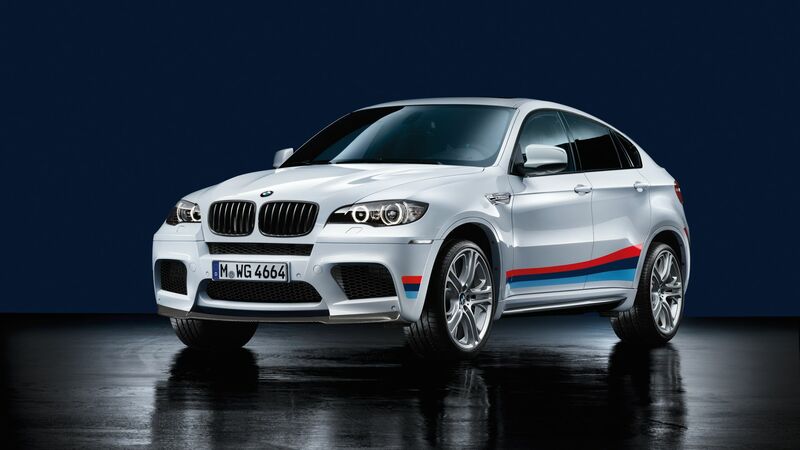 BMW M GmbH produced only one official special edition of the E71 X6 M: the X6 M Design Edition. What distinguishes the E71 X6 M Design Edition? 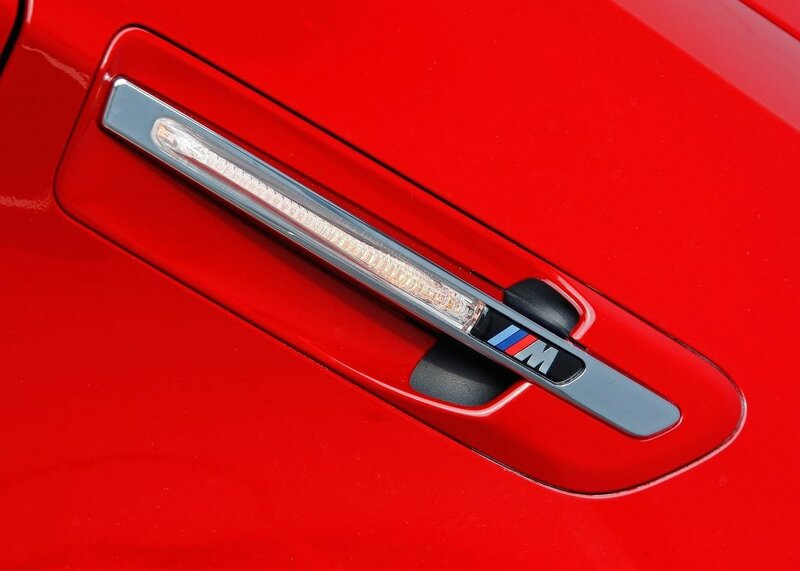 The E71 X6 M Design Edition combined many of the cosmetic accessories available from the BMW M Performance accessory line with a unique BMW Individual interior. 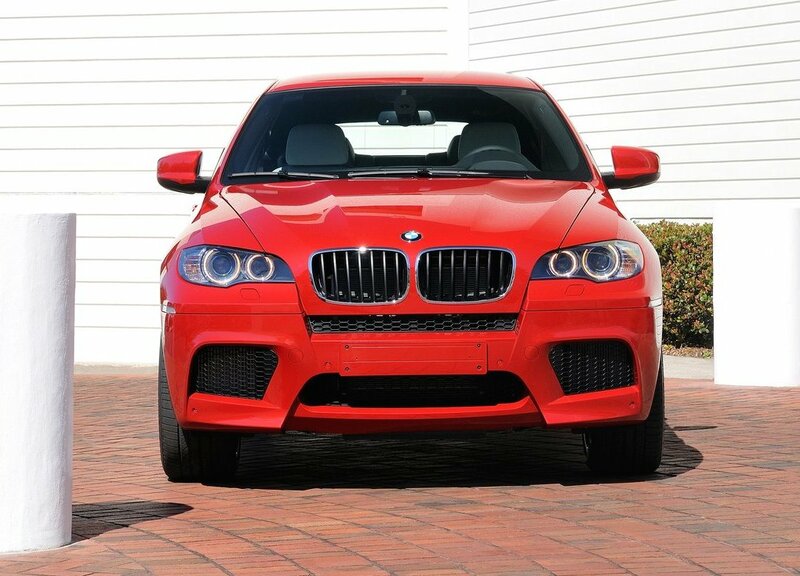 Specifically, it featured the BMW M Performance black front "kidney" grille, BMW M Performance carbon fiber front spoiler lip and BMW M Performance carbon fiber rear deck spoiler, as well as the tri-color BMW M Performance side stripes and 21-inch BMW M Performance alloy wheels (Style 310M). Further exterior touches included mirror caps and the rear diffuser insert painted in Black Sapphire metallic (instead of the usual body color). 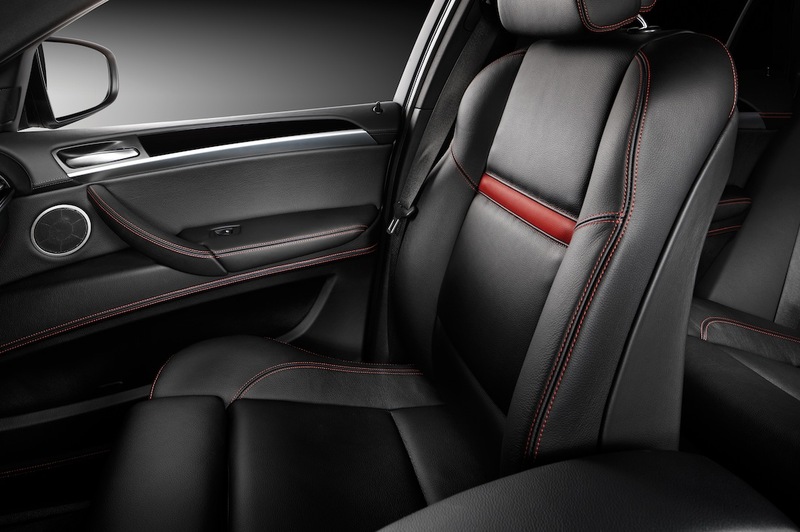 For the interior of the M Design Edition, Black complete Merino leather interior with BMW Individual Piano Black trim was enhanced with Mugello Red contrast stitching throughout, as well as Mugello Red Merino leather strips on the dashboard and M sport seats. There were no mechanical enhancements to this special model. 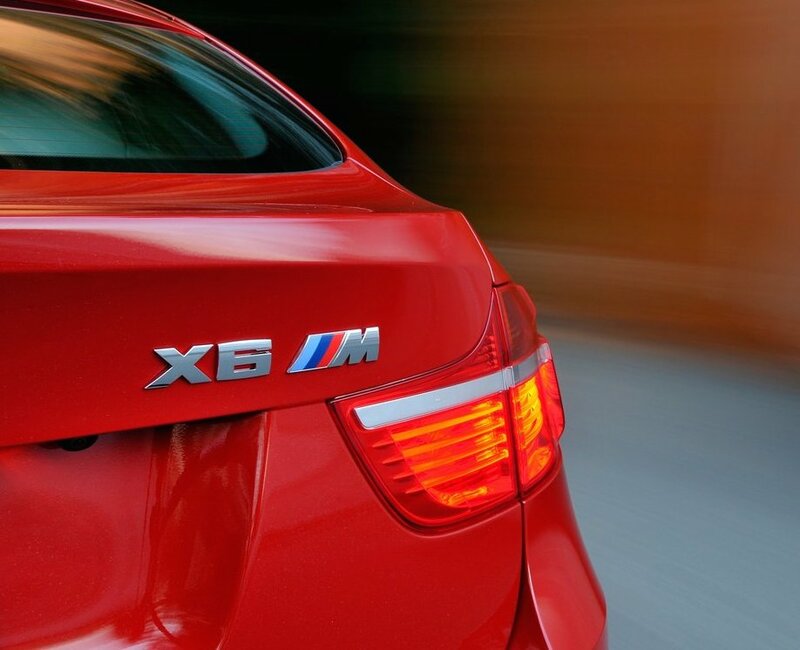 Though BMW M claimed the X6 M Design Edition would be limited to 100 examples (the same number referenced on the special dash plaque), in actuality only 60 units were ultimately produced between September of 2013 and May of 2014. All were left-hand drive models (GZ01) in one of three exterior colors: Alpine White III, Black Sapphire metallic or Melbourne Red metallic. The majority of these were sold in Russia, Latin America, the Middle East and Brazil.